Central California Wildflowers - A true springtime treat just about anywhere along the central coast, but especially on the back roads and scenic drives that are so abundant here. A gallery of some of the beautiful wildflower varieties seen here with information on the best places to see them as well as help with identification. 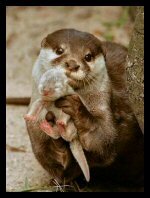 A previous Photo of the Week selection. 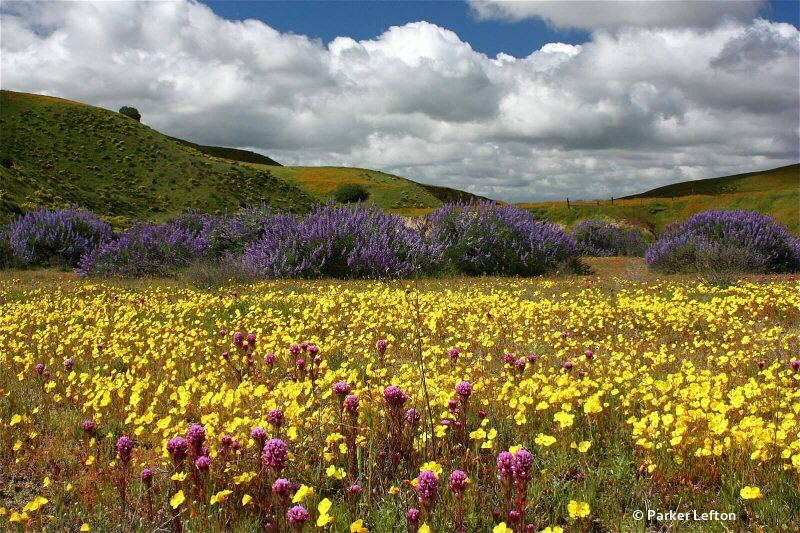 Have you seen some beautiful wildflower displays? How about sharing with us? Click here to let us know when and where and to upload photos. 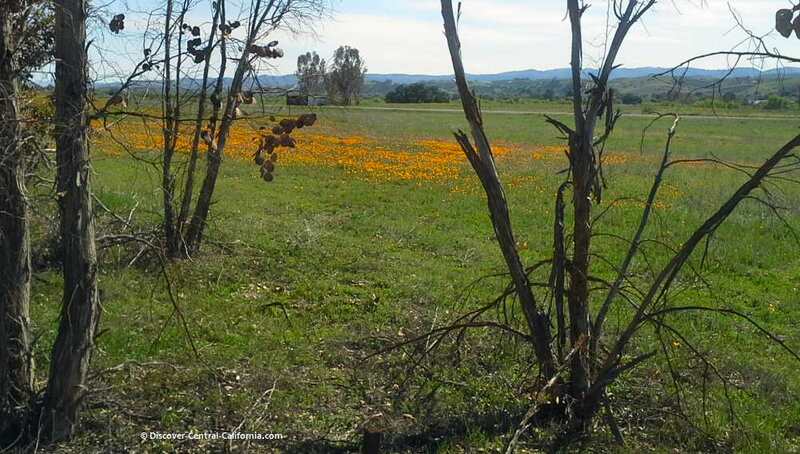 Central California wildflowers appear in the spring in response (mainly) to our winter rains. It is a time of the year when our hillsides are cloaked with abundant grass. It doesn't last long - as the rains end in April the soil begins to dry and the green eventually turns to brown. The window for the appearance of wildflowers really begins around now (mid February) and lasts into May. 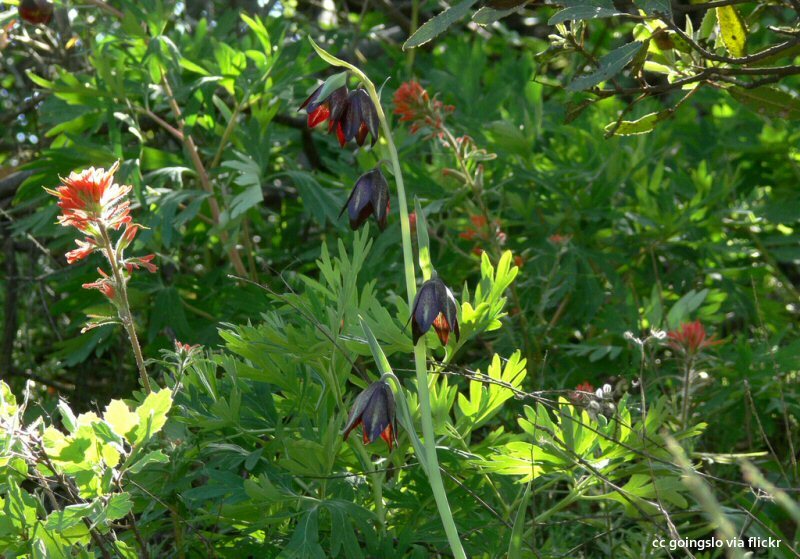 As in all things natural, each wildflower species has its own characteristic habitat, preferences and timing. There are some links to wildflower resource pages in the right column. I haven't yet found any site or organization which is focused specifically on Central California, but there is good information on those pages. Additionally, you might consider checking out the books in the box below here. They are all good and with different approaches so one might appeal to you more than the others. 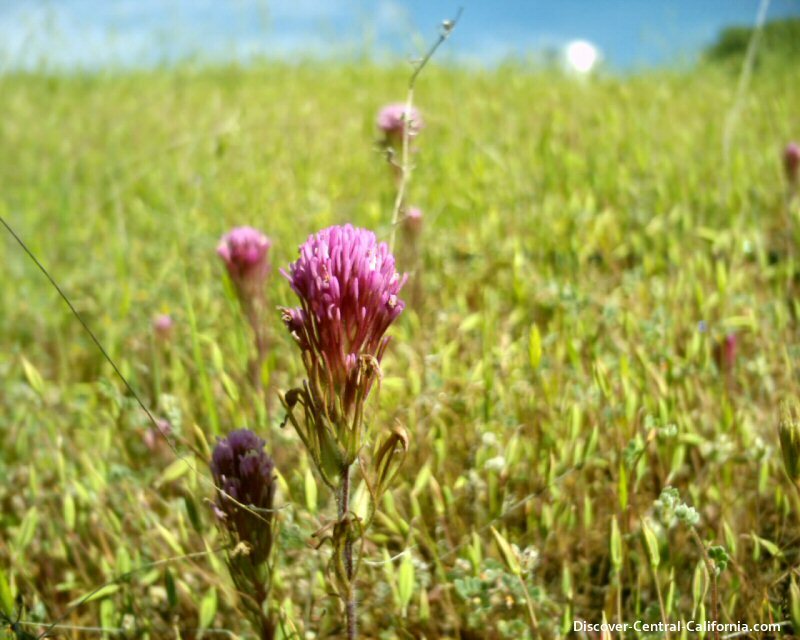 Many places along the Central California coast host beautiful displays of wildflowers. I've created a page exploring the beauty of coastal wildflowers here. Lupines and bush lupines, a member of the pea family, are common sights in the springtime. They can be found on hillsides as well as along roadways, as this one was. 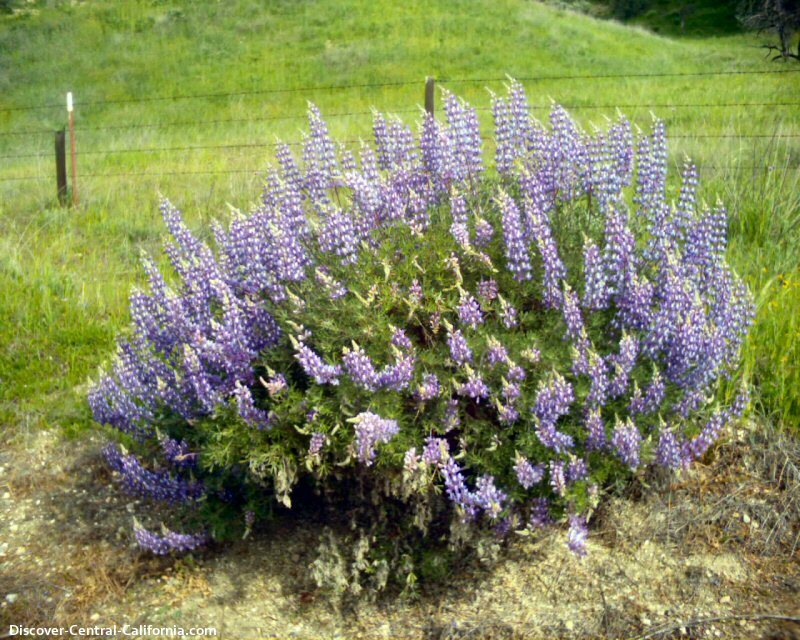 Highway 46, west of Highway 101, is home to many lupines of various colors. 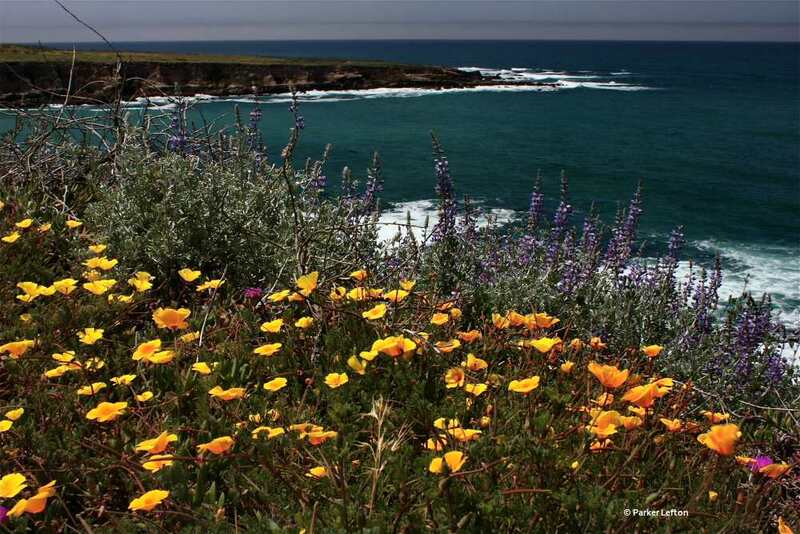 Besides being a great scenic drive to the coast, the wildflowers in the spring add their beautiful color. Bitterwater Road runs south 32 miles from Highway 46 east of Shandon in San Luis Obispo County to Highway 58 at the north end of the Carrizo Plains. I took the photo above on a weekend drive in March 2015. There were no huge displays of wildflowers, but here and there were found interesting stands of color most of the way. 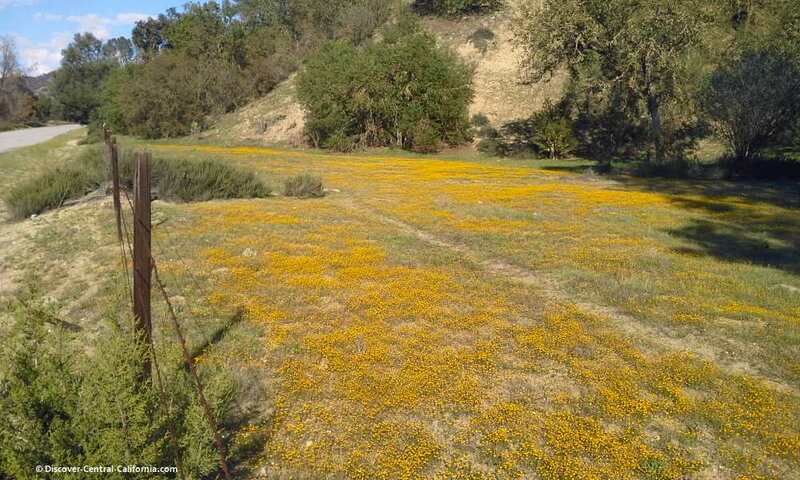 Vineyard Canyon Road isn't as famous for wildflowers as Shell Creek Road, but it does hold its own and 2015 is turning out to be a good year. 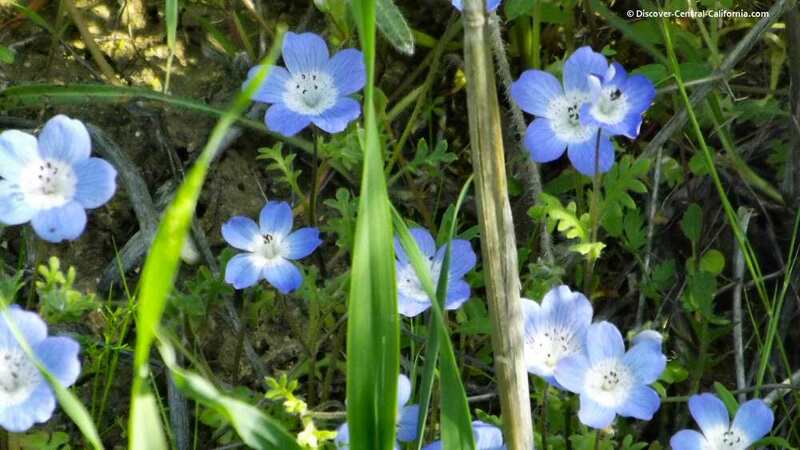 There have been hillside and valley floor displays of poppies; mustard and lupine on the hillsides; baby blue eyes in a few places and the old stand-by - goldfields can be found midway between San Miguel and Parkfield. Even though the 2013-14 rainy season was very poor in terms of amount of rainfall, the timing of the rains was close to perfect. The hills here in Central California are now green (April 2014), most of the winter hay crops are thriving and thankfully there is pasture for the livestock. 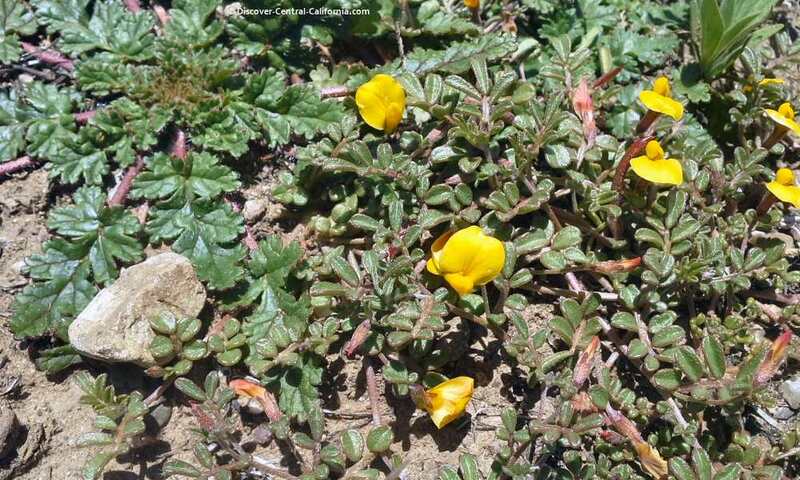 In my travels around the area in the last few weeks, I have seen some modest displays of wildflowers: poppies, lupines and an unidentified small yellow flower. 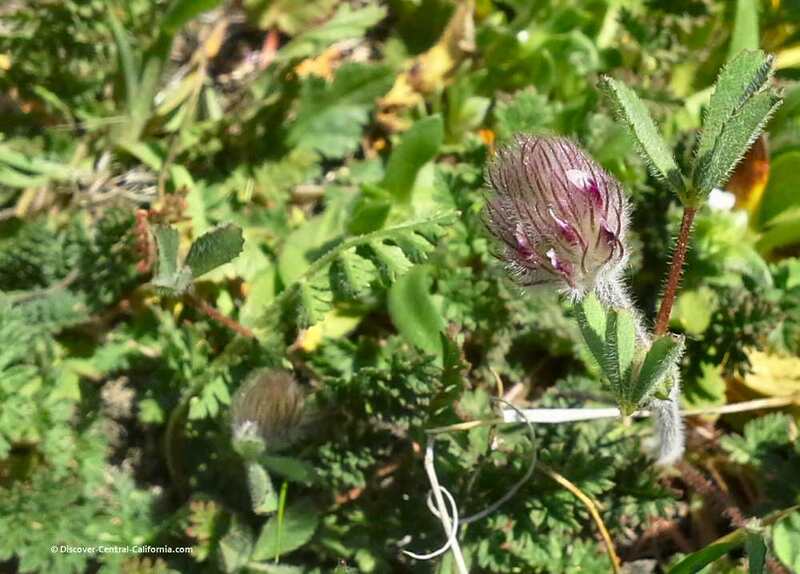 I have also seen many tiny wildflowers in the pastures of my ranch and I'll share some of the photos of those. A brother-in-law of mine is a knowledgeable and observant naturalist. If I have questions about a plant or animal species, he's the one to ask. He visited this last weekend and I asked him about these little wildflowers. He called them "belly flowers" meaning that you really need to get down close to the ground to see most of them. 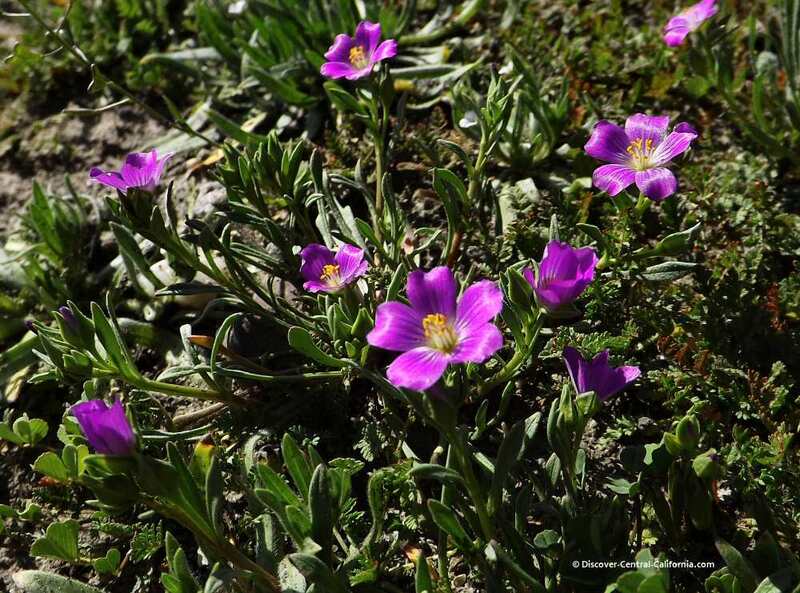 These little flowers are beautiful and yet if you are touring an area by car, you will miss them. They don't present the large and dramatic displays like some of the other Central California wildflowers. Above is a wide view photo of one of my pastures. The area shown is about 40 feet from the camera. You can see a bit of color, but nothing really impressive. In a car passing by, you wouldn't even give this field a second look. This is what the same flowers look like up very close. The size of these flowers is about 3/8 of an inch across. They are beautiful but you do need to get close to see them. These little white flowers are even smaller than the purple ones. They are 1/4 inch across and even if you are walking they are easy to miss. 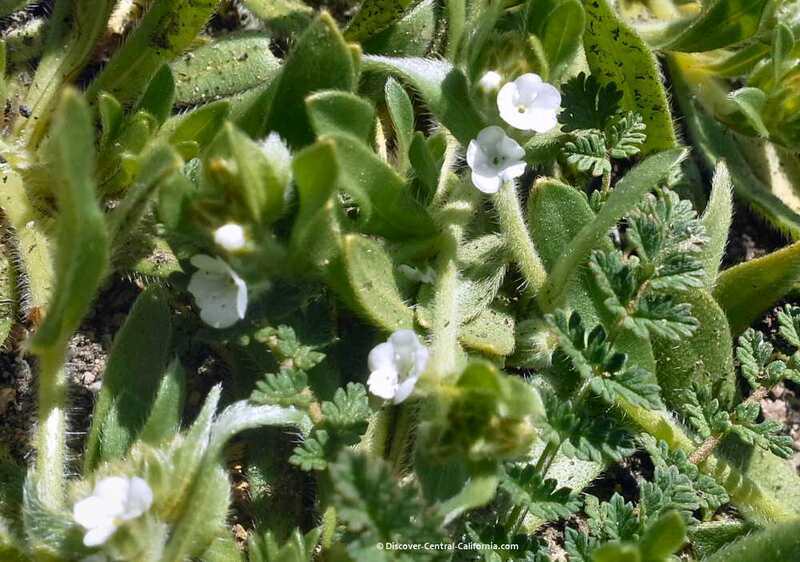 The flowers of these tiny lupines are only an inch high. I've noticed that at any distance, the blue color of lupines tends to blend into the green background and are difficult to see. This is true for regular sized lupines as well. A tiny clover - very hard to see unless you're close to the ground. These unusually shaped yellow flowers on succulent-like stems are only 1/4 inch across. Yellow shows up much better against the green. 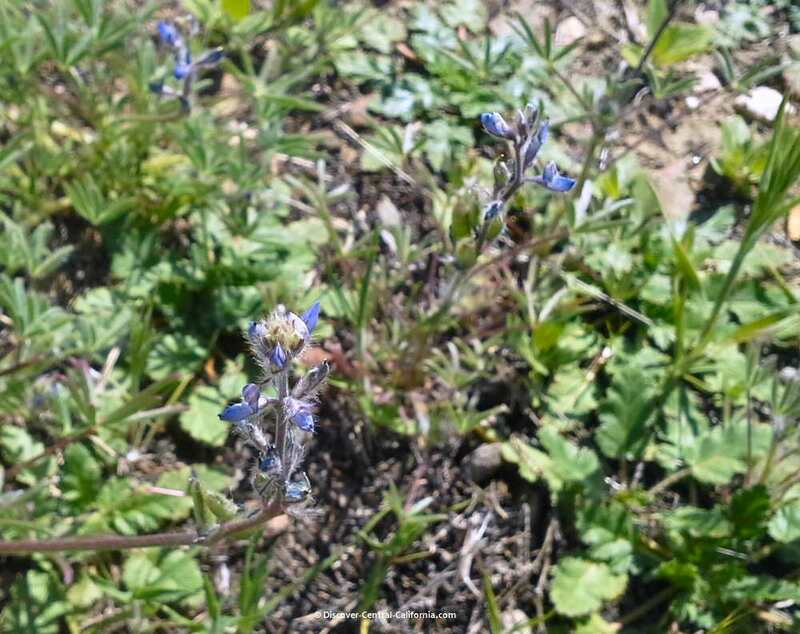 These wildflowers are larger, approximately 4 inches across and thereby easier to see. This variety of California wildflowers tends to grow in larger displays than some of the other tinys. My BIL says that biologists classify this as a "D___ned yellow composites" or DYC. I suppose that means there are many varieties of these. 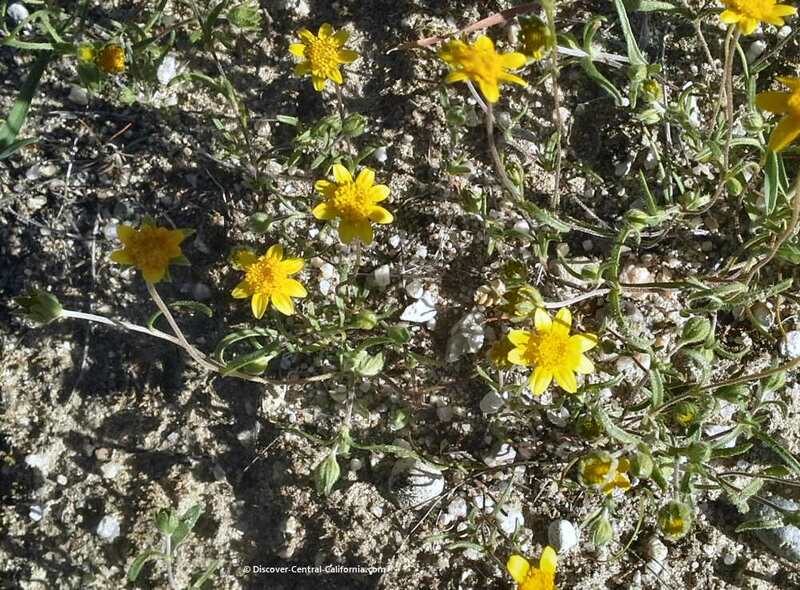 These are Lasthenia californica and are sometimes called "sunshine". No matter the name we can certainly enjoy the show they put on. These were found on Vineyard Canyon Road in southern Monterey County. The upshot of all this is to take some time, get out of your car and explore a little bit along the side of the road. If you see a patch of color, chances are there are tiny wildflowers waiting for you to get close and view their miniature beauty. 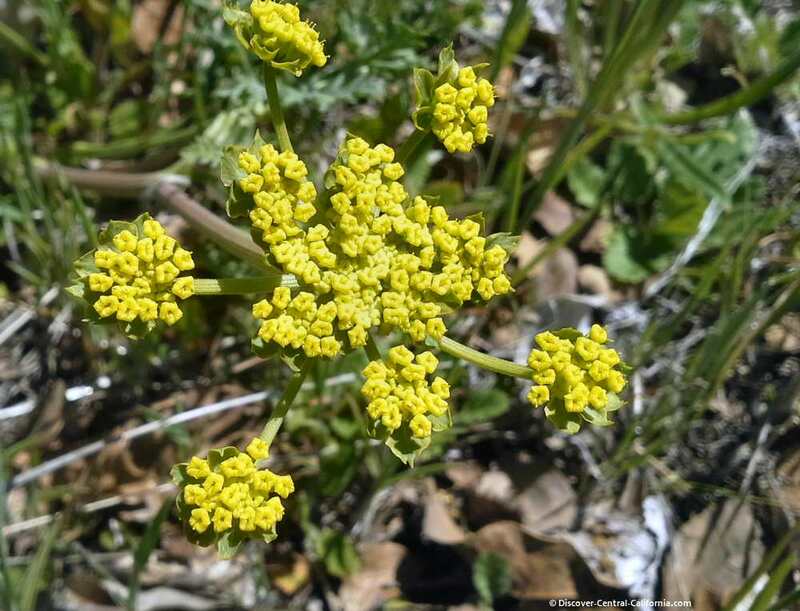 Check the link in the right column under "Bureau of Land Management for directions and wildflower information. 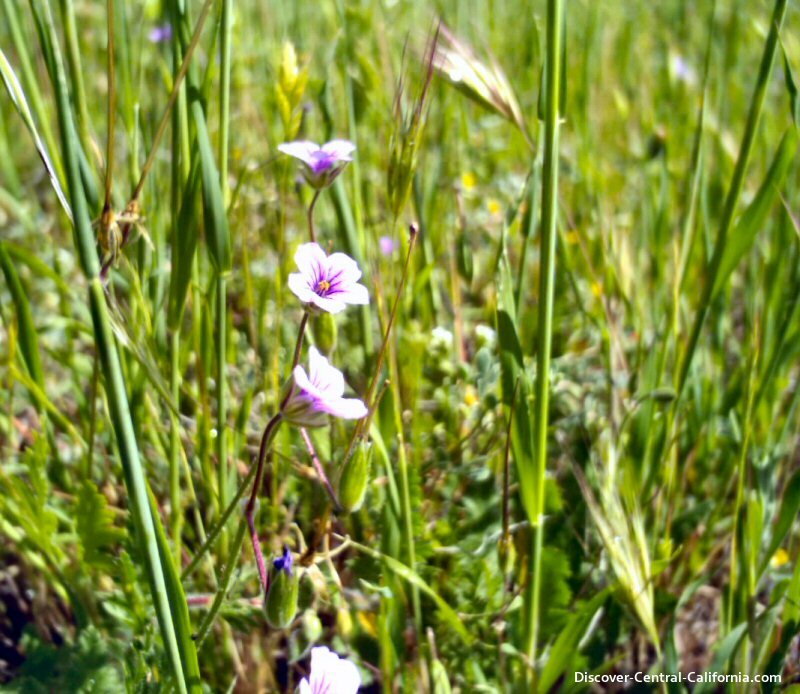 This area off Highway 58 south of Shandon, has gained a reputation for one of the best wildflower areas on the central coast. GPS coordinates: 34.47, -120.329. It can be reached coming either from Highway 58 or south from Highway 46. This road parallels Highway 101 north of San Miguel. It ultimately connects up with Highway 198 by way of Peach Tree Road. There are no services on this road of any kind and cell service is iffy, but the road is good and pleasant. Check out our tips for backroad driving on this page. Heads NE from San Miguel toward Parkfield. Poppies, fields of tiny yellow flowers, bush lupines and other minor displays of wildflowers. Lovely road with a wine tasting trail. One of our readers generously offered us the use of one of his spectacular photos of the Shell Creek area which we've used here. The last "great" year at Shell Creek was 2010. There are many factors beside rainfall which influence the bloom of wildflowers and not all of them are fully understood. 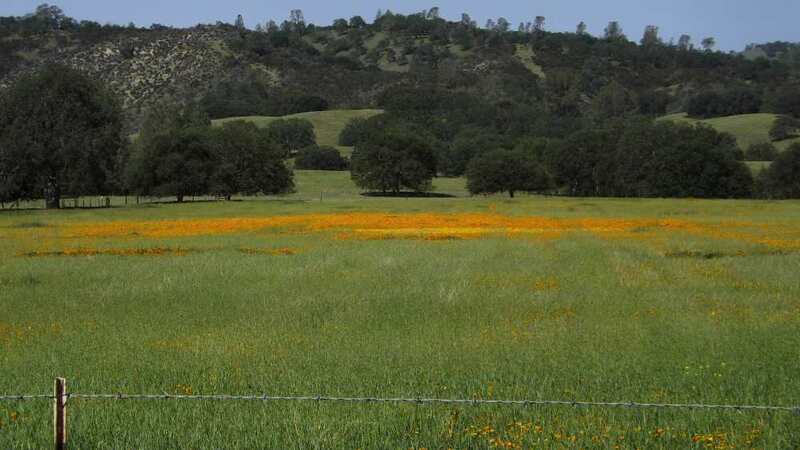 It is still early in the 2012-2013 season, but more rain is needed for agriculture in Central California, if not for the wildflowers. 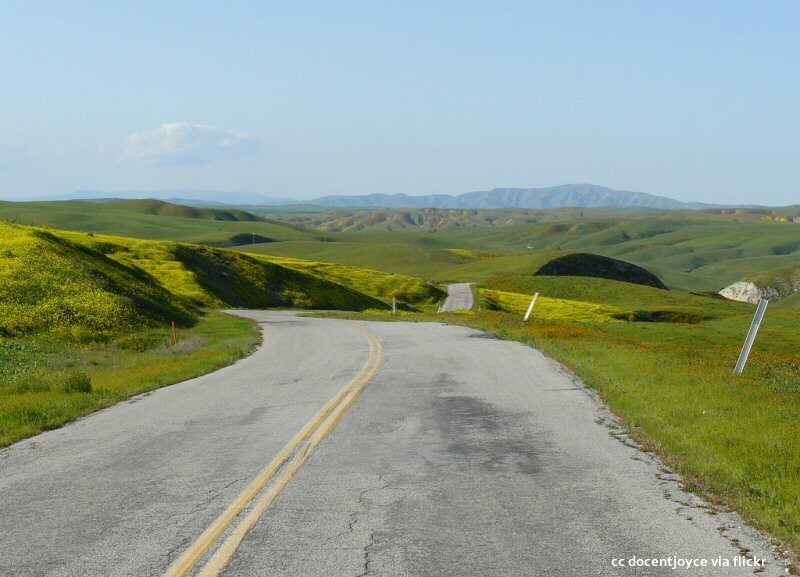 This road will take you past the Pinnacles National Park and is prime cattle country. 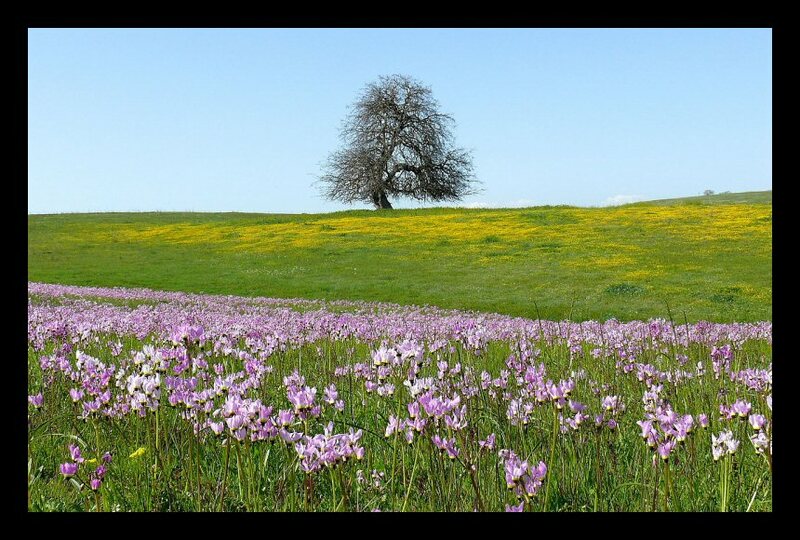 Not much in the way of woodlands, but the rolling hills and valley floors can be carpeted in wildflowers in good years. Passing between Lakes Nacimiento and San Antonio, this great back road drive can be accessed either from King City or Paso Robles. The attraction here are really the wide valley floors with abundant oaks setting the stage for the displays of wildflowers. If you check out the link for Bitterwater, you'll find a Google map there which will show that this road parallels Shell Creek. There are also more good wildflower photos there. 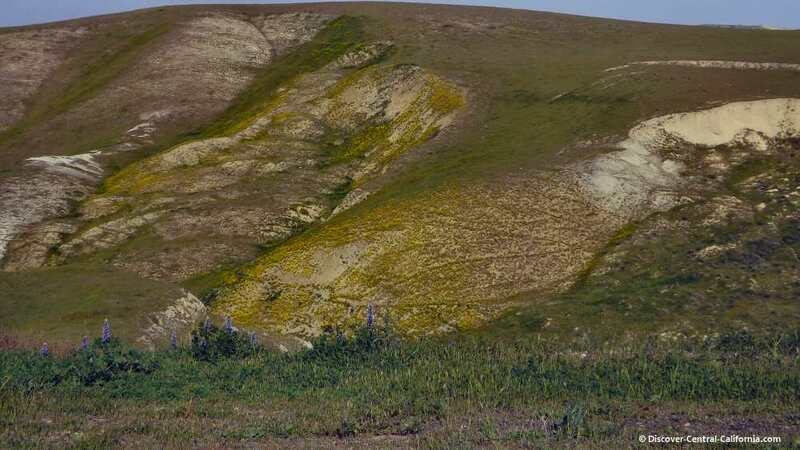 There are many other places that wildflowers can be found, but these are some of the best places with large and varied displays. Nice displays of various colored lupines along the roadside cuts. Probably introduced by CalTrans and not native, but they are still quite pretty. Fiddlenecks - you can see why it got this name from the stems visible in the background. Wildflowers can come and go quickly! 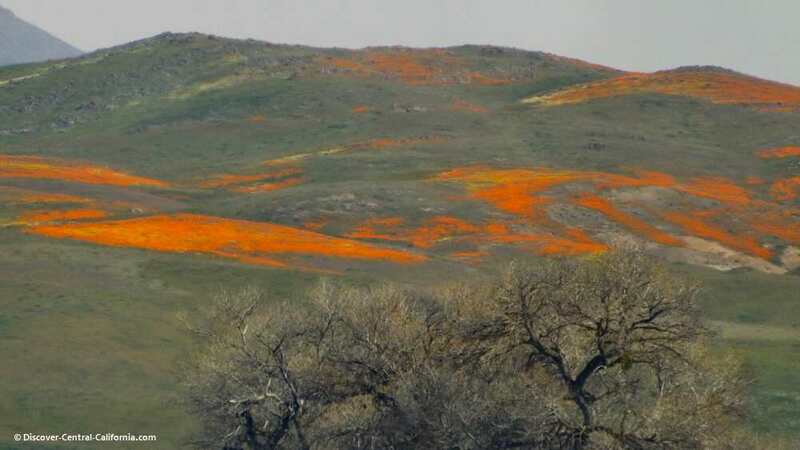 And none of us can cover the entire 10,000 square miles of Central California during the wildflower season. So let's help each other out and report here with your story and photos about where there are blooms to be seen. 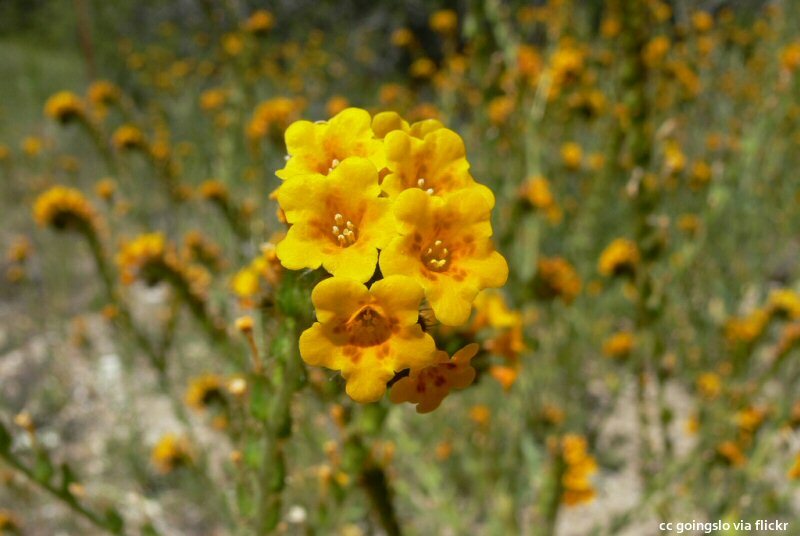 Where have you seen wildflowers? Your report will appear on a Web page exactly the way you enter it here. You can wrap a word in square brackets to make it appear bold. For example [my report] would show as my report on the Web page containing your story. Do you have some photos to add? Great! Everybody loves wildflowers! Click the button and find the first one on your computer. Select it and click on the button to choose it. The yellows are so intense and everywhere! 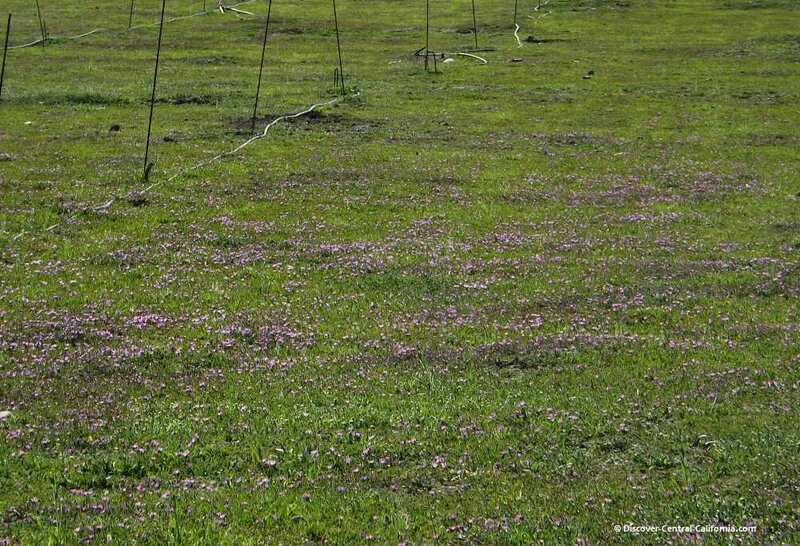 End of May 2018, field flourishing with Blue Eyed Grass. This field will not be here next year because of mass development in the area. 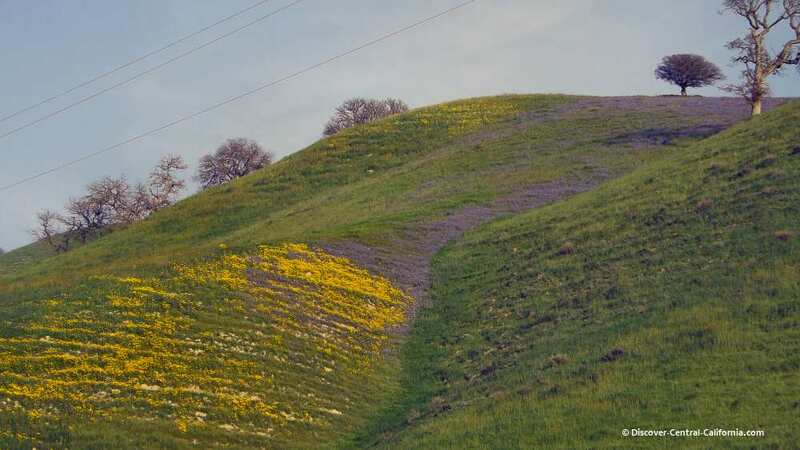 March 8, 2015 Beautiful wild mustard, fiddleneck and some blue flowers are out now on the section of Hwy 25 from 198 to Lonoak Rd. 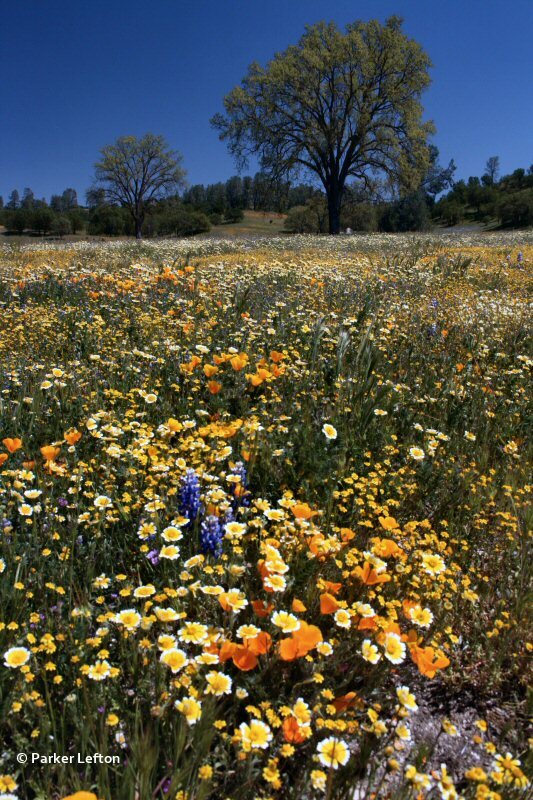 Santa Margarita Wildflower Festival: The 2014 festival was cancelled due to the drought, but it will go forward in 2015.